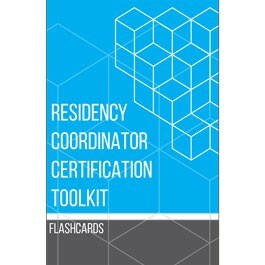 The Residency Coordinator Certification Toolkit is an easy-to-use study tool that residency and fellowship coordinators can use to review the ins and outs of the role in relation to the program and institution. With 200 flashcards and a workbook featuring 50 questions concerning coordinators’ responsibilities, you can use this toolkit to test your ACGME accreditation knowledge and ensure your facility is in compliance. Comprehensive—The toolkit covers various topics related to the coordinator role, including the ACGME Common Program Requirements, Institutional Requirements, and Policies and Procedures. Structured—Sample questions and flashcards help you learn what exam material you’re strong and weak on. Time-saving—No need to create your own flashcards; we’ve done the heavy lifting for you. The sample questions featured in this workbook are intended as a resource to assist with studying for the National Board for Certification of Training Administrators of Graduate Medical Education (TAGME) assessment. The questions featured in the actual TAGME assessment are randomized and will differ from those featured here. This toolkit is not affiliated in any way with TAGME. Crys S. Draconi, is a medical education manager for neurosciences at Tufts Medical Center in Boston and an independent graduate medical education consultant. Draconi has been active in the medical administrator field since 2008 and has been instrumental in the advancement and recognition of the coordinator role, including her passion of mentoring and coaching the next generation of administrators. She has held many leadership roles, including being on the board of directors for the Massachusetts Society of Academic Medical Administrators, independent consultant/director of operations for Association of Radiation Oncology Program Coordinators, and leader of the Coordinator Description Task Force.